Second qualification: The analysis Dr. Kreeft employs in the section below (i.e., in The Two Logics excerpt) is primarily aimed at professors of philosophy in to order promote a book he’d written. So, it is an excellent summary yet it is intended for a fairly advanced audience in philosophical studies. If you are a new student in this area of study please do not be discouraged if you do not immediately pick up on what he is saying. This is precisely where a study group such as ours can, and will, come in as a great assistance. That to say, if you would like to learn more about this kind of study you’ve come to the right place. If you want to learn more about these kinds of ideas please do join us in our discussions. After all, this is our purpose, or at least one of the main reasons for our existence. Click here for a PDF of analysis taken from a chapter out of Peter Kreeft’s book, Socratic Logic, titled ==> The Two Logics . The root of a fundamental philosophical criticism which have been leveled at Socratic/Aristotelian, or traditional logic, stems from the root misunderstanding of The First Act of the Mind, Understanding. In an attempt to basically delineate, clarify, and defend this position I would like to invite you to these hot linked studies (as you can see there are three, two are on the same topic however; one is shorter than the other) the other was taken from Peter Kreeft’s book, Socrates Meets Kant, which allows us to consider the act of Understanding under a clear light. Intelligence, as traditionally understood, involves three acts, or basic capacities. First capacity, there is the capacity to grasp abstract concepts, such as the concept man, which is what you have when you not only know this or that particular man or this or that particular subset of men, but what it is to be a man in general. To have the concept man is to have a universal idea that applies to all possible men, not only those that do exist or have existed, but also all those that could exist. Second capacity , there is the capacity to put these ideas together into complete thoughts, as when you combine the concept man and the concept mortal in the thought that all men are mortal. Third capacity, there is the capacity to infer one thought from others, as when you reason from the premises that all men are mortal and Socrates is a man to the conclusion that Socrates is mortal. Obviously the capacity to grasp abstract or universal concepts is the most fundamental of these three. You couldn’t form complete thoughts or reason from one thought to another if you didn’t have the concepts that are the constituents of the thoughts. Now to have such a concept is to have a kind of form or pattern in the mind, and the same form or pattern that exists in the things you might think about. There is a form or pattern that all men have that makes them all the same thing—namely, men; there is a form or pattern that all triangles have that makes them all the same thing—namely, triangles; and so forth. Now when these forms or patterns come to exist in material things, the results are the various individual objects—individual men, individual triangles, and so forth—that we find in the world around us. When we think about men or triangles in general, though, we abstract away from all the different particular men and triangles, and focus on what is common or universal to them. And that is really the essence of strictly intellectual activity—the capacity to have the universal or abstract form or pattern of a thing without being that kind of thing. A material object that has the form or pattern of a triangle just is a triangle. When you contemplate what it is to be a triangle, you have that form or pattern of being a triangle as well, but without being a triangle. Taken From ==> Edward Feser‘s: Five Proofs for The existence of God: (Location 471). If you would like to investigate a bit further into the kinds of distinctions philosophers and theologians have made provide viability to this form, or mode, of thought which Kreeft assumes in his contentions in The Two Logics, please consider these documents. The hot linked pages are abstracts from an R.C. Sproul (one of the philosophers on our group’s site) book titled Classical Apologetics, which presents the three non-negotiable ideas, 1) the law of non-contradiction, 2) causality, and 3) the basic reliability of sense perception). Dr. Sproul asserts that these three principles of thought must be assumed in any rationally defensible discourse of apologetics. So we would encourage you to join us in a consideration of these principles. The final link is a consideration of how these ideas, principles and concepts, for so long denied and misunderstood, can help us to see clear of some of the confusions that have developed in our world as a result. The last link is a summary PDF of all of logic. 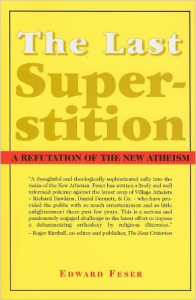 For anyone who would like to read more about these issues which employs a throughgoing analysis that is second to none, it can be found in Dr. Edward Feser’s book titled The Last Superstition. Just click on that hotlink and you will arrive at our page where you can find out more about this facinating subject, more about this book along with order information for those who would like to obtain a copy. If you enjoy thinking about these sorts of concepts and issues you might want to visit our page that gives detail to the controversial debate that arose between Lewis and Elizabeth Anscombe. If you’re not familiar with that exchange you will definitely want to look into it. If so click here for our ==> The Lewis/Anscombe Debate page.